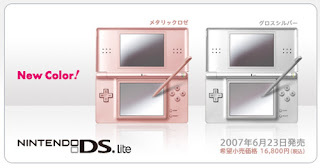 Nintendo Japan announces two new colors to the DS lite Lineup- Metallic Rose and Gloss Silver. No idea if they will hit the US, the pretty color Ice Blue (my personal fav) never reached our shores. Want one of the new colors?